The Winemaker Detective Benjamin Cooker and his sidekick Virgile now join the illustrious list of cognac lovers, which includes Napoleon and rap star Nas. According The Wine Enthusiast, "Cognac has serious clout among discerning drinkers... Cognac is a hot commodity with crossover appeal for wine drinkers." Authors Jean-Pierre Alaux and Noël Balen are not ones to disagree. The newestWinemaker Detective mystery is called Cognac Conspiracies. The heirs to one of the oldest Cognac estates in France face a hostile takeover by foreign investors. Renowned wine expert Benjamin Cooker is called in to audit the books. This amateur detective/cozy mystery, translated by Boulder-based translator Sally Pane, has a distinctly French flavor to it, as readers get an inside view of the French wine and, in this case, spirits, industry with a gentle mystery, and a lot of atmosphere. It hits bookstores this week, so don't miss it. Click here to find it at a local bookstore. "So evocative of France, you can visit it in an afternoon without leaving home." "The Winemaker Detective Mystery series is a new obsession." ... let us know what you think of it. 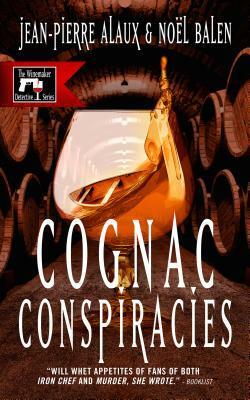 Chantelle over at Sirens of Suspense just interviewed Jean-Pierre and Noël, the authors of Cognac Conspiracies, which comes out this week, which is part of the ongoing Winemaker Detective mystery series. She begins with this question. There are twenty-two books in the series so far (though only four published to date in the U.S.), as the series grows and evolves, do you find it easier or more difficult to fall into the story and discover new and exciting plots? She goes on to ask them about their writing partnership, their other interests, having their books adapted for television, and what's in the works. No, I'm not actually proposing that as a cocktail, although a classic champagne cocktail from Martha Stewart contains just that, along with bitters and a sugar cube. No, that's not for me. I already get glares and eye-rolling from some French friends because I like ice cubes in my champagne. One friend from Reims, the homeland of bubbly, treats it as blasphemy. But I digress. My topic today is actually cognac and the region, because in our upcoming release, the Winemaker Detective goes to Jarnac, an haut lieu of cognac production. I mention champagne only because the region of Cognac is divided into six zones—Grande Champagne, Petite Champagne, Borderies, Fins Bois, Bons Bois and Bois ordinaires. A cognac blend made of Grande Champagne cognac and Petite Champagne cognac makes a Fine Champagne cognac. Of course, the drink cognac, as Grande, Petite or Fine a Champagne it may be, has nothing in common with the sparkling wine. Cognac is a brandy, distilled from wines made from specific grapes grown in specific areas of (primarily) the Charente and Charente-Maritime region of France. It goes through two distillations, in an alambic, and is aged in oak. Now you know. In Cognac Conspiracies, the Chinese are trying to buy out one of France's oldest family-run cognac estates. Benjamin Cooker is called in to audit the books, and of course the waters are murkier than one first imagines. In this story, the characters find their loyalties being tested in an eerie small-town setting. In their usual fashion, the authors take us on an Epicurean adventure of discovery. Jean-Pierre tells me that he has a special soft spot for both cognac and armagnac, both of which he usually enjoys with a cigar. As for cognac, he particularly enjoys those made by Delamain. The official release date for Cognac Conspiracies is February 18. You can preorder it now on your favorite platform or at your favorite bookstore. In the run-up to our new Winemaker Detective release, we're doing a Goodreads giveaway for Cognac Conspiracies. Check it out. Enter to win. Spread the word. Giveaway ends January 30, 2015.